The DXF/DWG options dialog appears when the OPTIONS button option is selected from the Export Options dialog. Export Spline as Polylines – When selected, any splines in the file being exported will be translated as polylines. Chord Height Tolerance - This option allows you to set a chord height tolerance for exported entities. The default is 0.005. To change this entry, type a new number in the field. The minimum chord height tolerance is 0.0005. Note that there is no maximum chord height tolerance. Default Font Name - Enter the font name to which all fonts in the export file will be converted. AutoCAD Version - Select the AutoCAD release file format to which the export file will be saved. It is important to keep in mind the target AutoCAD version when selecting release format here. For instance, you should not select Release 2000 if the target version (where the file is to be imported) is AutoCAD 14. Translate Special Characters - When selected, special symbol characters used by KeyCreator will be converted into their AutoCAD equivalent symbol. When cleared, special symbol characters are not converted. From layout mode export to 2D model space - When selected, all entities from both model and layout mode are exported. When cleared, only the entities that you select are exported. When exporting from layout mode, all entities from model mode and the entities that select from the active layout are exported. 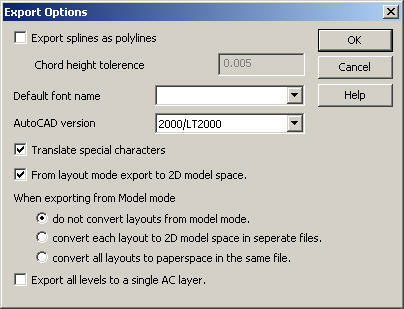 Do not convert layouts from model mode - When selected, only the model mode entities selected are exported. Convert each layout to 2D model space in separate files - When selected, the model mode entities selected are exported to the filename provided. Each layout is exported to a burst model with the filename provided plus the name of the layout. For example, exporting a part with a layout named "Layout1" to a dwg file named "Exported" results in the following two files: "Exported.dwg" and "Exported Layout1.dwg." Convert all layouts to paperspace in the same file - When selected, each layout in the part is exported to paperspace. "AC" in the name of this check box stands for "AutoCAD." When you select this option, all of the geometry in the KeyCreator file is flattened to a single layer in the exported file. This is useful for exporting layouts.